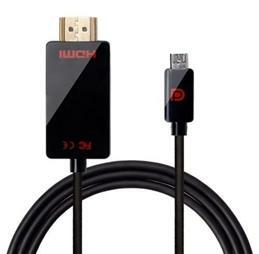 Works with millions of HDMI-enabled displays, projectors, laptops or TVs. Support Full HD 1080P 60HZ 3D images. Enjoy multi- screen productivity with the connection of a simple cable. View videos, photos, documents and presentations on a large screen, while emailing, web surfing and texting on your mobile device. Connect mobile devices to any big screen.High speed micro USB (male) to HDMI (male) connector.